Refer your friends and get free ฿ 400 in Roojai Rewards when a friend buys insurance policy with Roojai.com. Special! Get an extra ฿ 1,000 Tesco Lotus card for free when you reach 3 referrals with purchases. 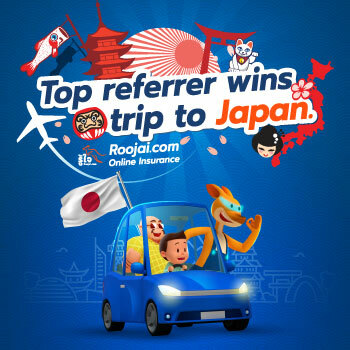 Top referrer wins trip to Japan with Roojai.com, get free a trip in Japan for 2 people. Redeem your points for special gifts. Refer your friends and get more rewards. Refer a friend to get 400 points of Roojai Rewards (equivalent to ฿400) for every refer with a purchase of any insurance type, any policy type, with us. This refer activity is only for our customers who have already bought any car or motorcycle insurance (big bike) with us. A person being referred get 100 points of Roojai Rewards (equivalent to ฿100) when he/she first buys any insurance, any policy type, with us via a code or Referrer’s link. The system will send your Roojai Rewards to your My Account at Roojai.com, where you can redeem your points. The Tesco Lotus gift card will be sent to you by post later. If we can’t send it or it is damaged, due to any cause other than our fault, such as wrong address, parcel return, or lost parcel during delivery, we reserve the right to consider that the parcel is sent to you. These privileges are only for general customers only, not brokers, sales agents, any person sub-selling our products without our consent, or any person acting as such. We reserve the right to ask for the return of points or gift cards, or the equivalent sum for customers who cancel their policies. We reserve the right to change the terms and conditions or to end the campaign without prior notice to you. In case of a dispute, the company’s decision is final. For further questions, please call 02 582 8866 (Mon-Fri 8: 00-20: 00/ Sat - Sun 9:00-18 00 - closed on public holidays). Get rewards then redeem them for gifts and special offers. When your friend buys an insurance policy with Roojai, you will get ฿400 of Roojai rewards. The more of your friends buy with Roojai, the more rewards you will get!